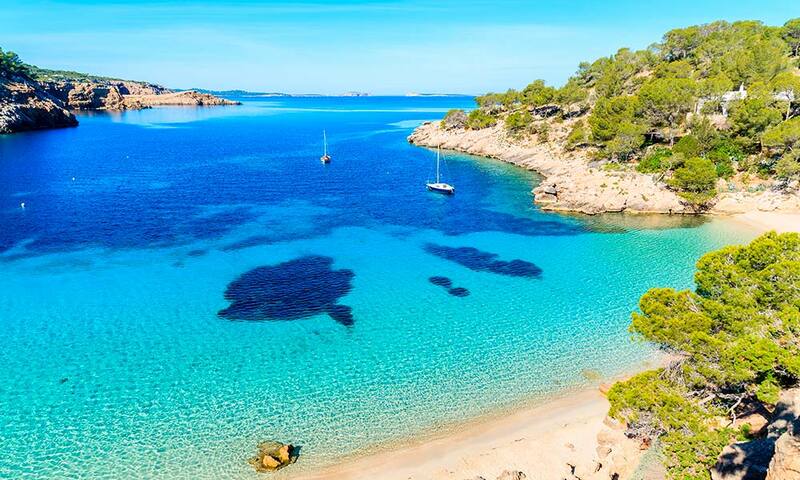 A stone’s throw from San Antonio are some of Ibiza’s most instagrammed beaches, such as Playas de Comte, Cala Bassa and Cala Saladeta. Even if you don’t want to break your idyll with the hotel hammock, it will be really hard to go back home without having filled your smartphone with selfies featuring turquoise seas in the background. This beautiful cove with tranquil waters is located only 5 minutes by car from our 4-star hotel. It is surrounded by pine tres, has fine sand and has several restaurants, so it makes for a very pleasant day on the beach. And if you stay all day, be sure to catch the sunset! 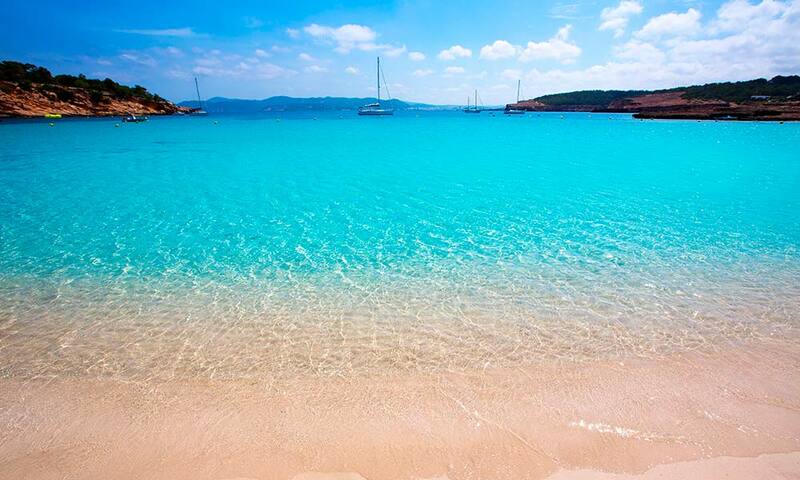 Four miles from Amàre Ibiza you will find one of the prettiest shores on the whole island: Cala Bassa. Its fine sand, gentle slope and crystal clear waters make this virgin beach a true natural pool. Framed by a forest of pine trees and junipers, it offers a fantastic panoramic view of Cap Nonó and has a very cosmopolitan and diverse vibe. Its gastronomic offering is provided by a very cool restaurant and a casual refreshment stall. It’s not too hard to get to the most photographed beach in Ibiza: a mere 15 minutes’ drive are all that are keeping you from the shore with the most superlatives on the island: most famous, most visited, most spectacular, most shared, most named… Its fame is due to the spectacular tone of the colour of its waters, that ranges from turquoise to deep dark blue. The catch? 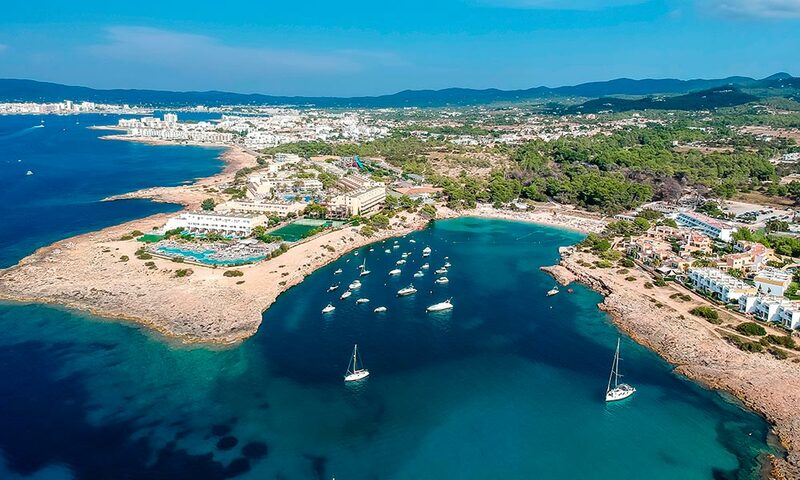 The three coves that make up this coastal set are rather small, but compensated by a wonderful panoramic view of the sunset and the de Ponent, sa Conillera and s’illa des Bosc islands. Of its three restaurants and small refreshment stall, Ses Roques and s’Illa des Bosc stand out: two Ibiza classics for rice and fish dishes. 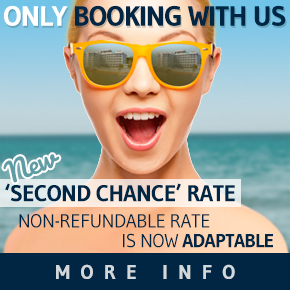 A good option on the west coast for enjoying a day by the sea with all the amenities. It has a wide range of restaurants and chic refreshment stall. You can rent kayaks and the vibe is diverse and cosmopolitan. In addition to the main sands, there is another small marine corner in the beach’s northern zone. If you are looking for peace and quiet, then this beautiful virgin cove surrounded by cliffs is the spot for you. Its waters are crystal clear, albeit with quite a lot of rocky substrate, so you are advised to use snorkelling footwear. The prize? If you like snorkelling, you’ll be busy for quite a while. 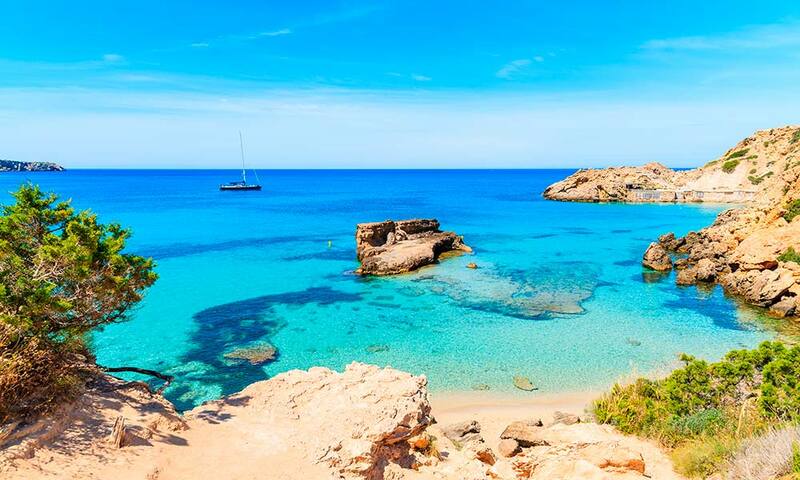 These two beautiful neighbouring coves situated 5 miles from our hotel in Cala de Bou are always in the top 10 beaches of Ibiza. To get the best panoramic view for your photos, follow the path joining Cala Salada with Cala Saladeta along the high part of the cliff. At lunchtime, be sure to order the paellas and fish dishes at the only restaurant open. 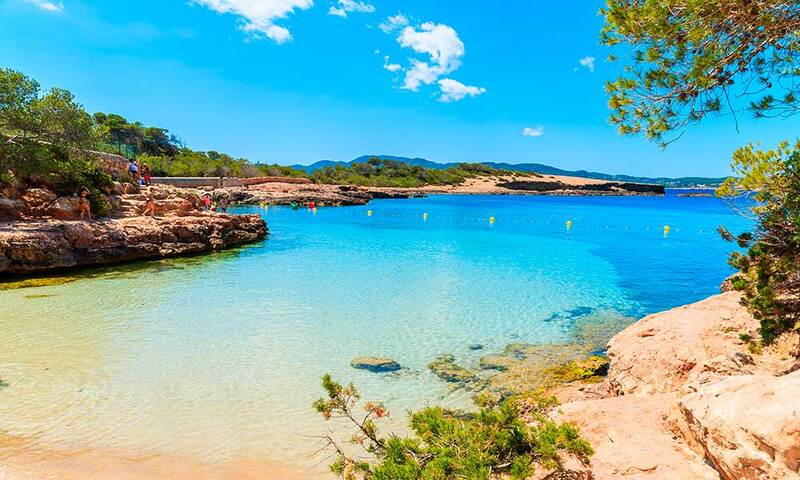 Tip: Cala Salada is part of the Ibiza Connected Beaches plan, which establishes bus connections between the beach and a satellite carpark. Do not hesitate to ask the reception staff for more information. 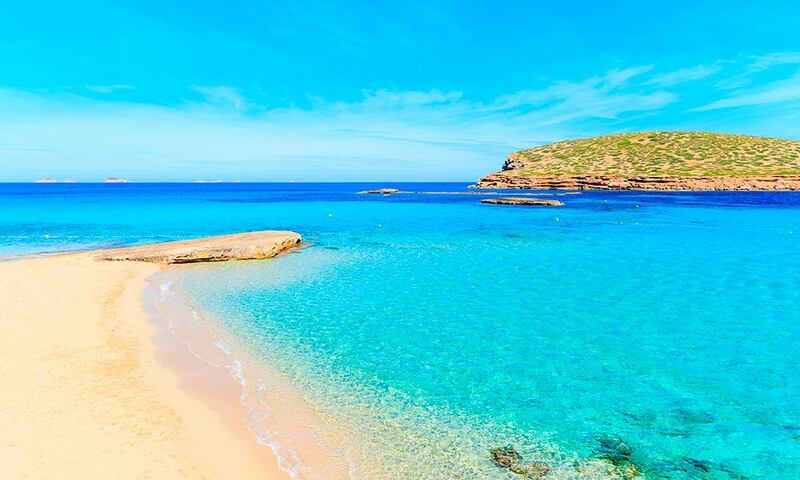 With crystal clear waters, fine sand and disabled access, this pretty beach with a marked maritime air is perfect as part of a day of exploration around the northern zone of San Antonio. Here you will find a typical beach refreshment stall and at the beautiful neighbouring cove, Cala Gracioneta, another chic refreshment stall. 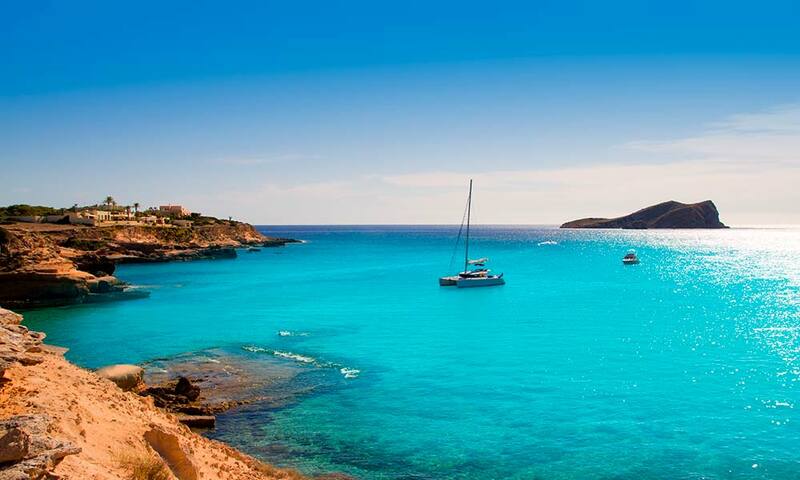 To get there, all you have to do is follow the coastal way that starts next to the fishermen huts at Cala Gració. Nine miles from the hotel is a place you will want to capture in yet another unmissable holiday photo: the island of Es Vedrà from the shore of Cala d´Hort. UNMISSABLE. 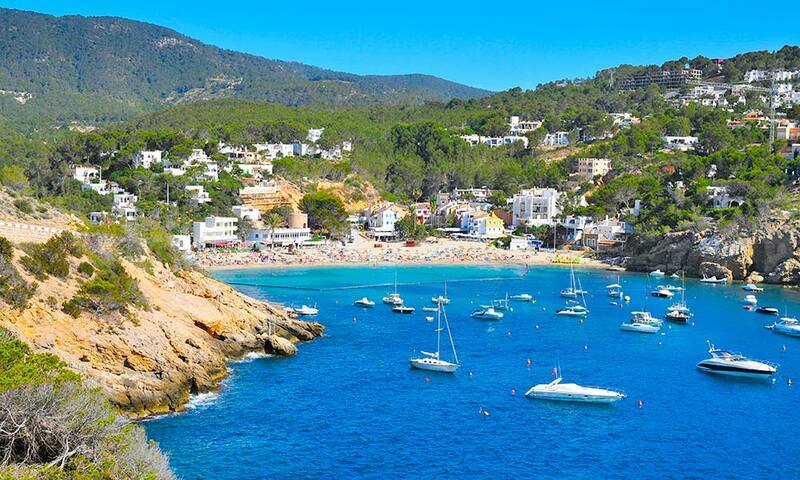 And you must try the rice dishes and paellas in the two restaurants located on this emblematic Ibiza beach. Pretty cove with tranquil waters and a diverse, though predominantly family vibe. It has a marked maritime air thanks to its fishermen huts. A perfect option for a relaxed day on the beach. This small urban beach in the town of San Antonio stands out for its crystal clear waters and, above all, its sunset views. 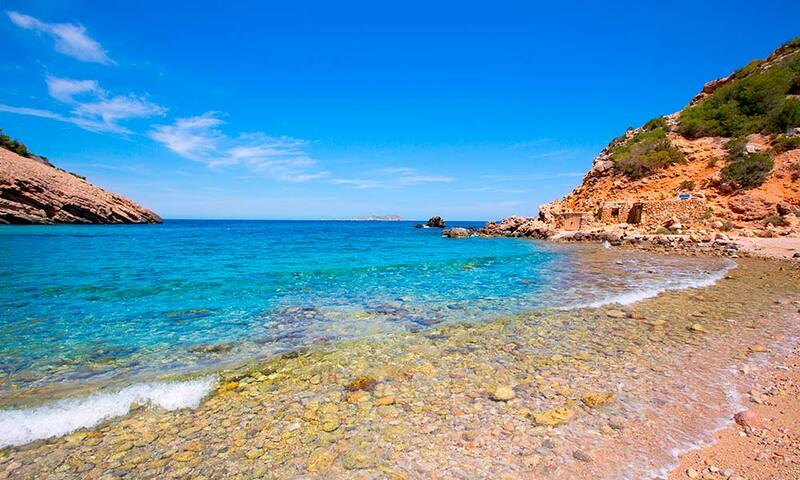 It is less than five minutes’ walk from the famous Café del Mar and Café Mambo. 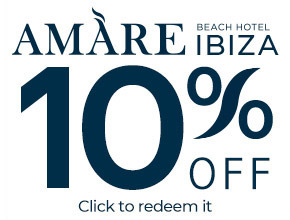 Our Amàre Beach Hotel Ibiza, recommended for adults, is located on the shore of Cala de Bou, in the actual San Antonio Bay. Its excellent location means that you can get to all the beaches and coves recommended in this article in just a few minutes by car. And for those times when you feel like staying at the hotel, you can relax in our three pools and enjoy the sunset from the Hayaca restaurant, from which the particular Amàre Ibiza Sunset Ritual is celebrated.